Gowns, hoods, caps, tams for Doctoral, Masters, and Bachelor degrees. Judicial Regalia that is affordably priced without sacrificing quality. Make those first academic steps forever memorable with the perfect touch of a real graduation! DIPLOMAS AND COVERS - CELEBRATE WITH RECOGNITION! Top quality diplomas and covers for that special day of achievement. Stock and Custom Diplomas available and Diploma Covers for that finishing touch! 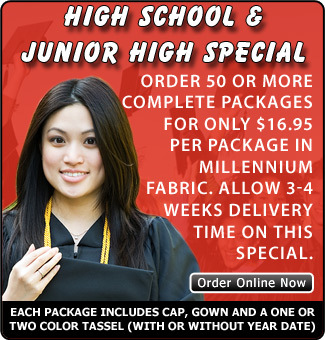 Graduations are momentous occasions and everyone deserves to have the highest quality, best price, and excellent service when ordering their caps and gowns. We at Capsngowns4less pride ourselves on providing the very best commencement ceremony offerings from preschool cap and gowns, high school, college, faculty and judicial caps and gowns, graduation tassels, stoles, cords, hoods, diplomas, diploma covers and keepsake items. Our cap and gowns for graduation are made of high quality materials and are suitable to keep as souvenirs for years to come. For our littlest graduates and our high school students our graduation gowns are made of 100% polyester, which is both lightweight and crease resistant. For our higher education and judicial customers, we offer both economy and deluxe style gowns and hoods. Whether you are earning your bachelors, masters or doctoral degree or you a member of the faculty, we have the graduation gowns you need. Of course, no commencement ceremony is complete without graduation caps. The mortarboard with a graduation tassel is a universal symbol for education. While some graduates may choose to rent or borrow a gown, the graduation cap is a keepsake that they will want to take home a treasure for years to come. Capsngowns4less has built an excellent reputation by providing high quality standards for both our products and our customer service. Our goal is to deliver products that precisely meet your needs with the best level of customer care possible. We are a company that is large enough to serve you but still small enough to care. We really hope you enjoy browsing our website! Just click on the links to the right to enter your area of interest. Mandeville, LA 70470-1122 USA Large enough to serve you.....small enough to care.